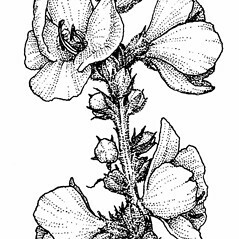 Verbascum phlomoides is a non-native species of mullein originating in Europe. It is introduced to New England states. filaments pubescent with purple hairs, bracts 2–5 mm long, and basal leaf blades cordate at base (vs. V. phlomoides, with at least the upper 3 filaments pubescent with white to yellow hairs, bracts 9–15 mm long, and basal leaf blades cuneate to rounded at the base). leaves decurrent on the stem nearly or completely to the next leaf and floral bracts 15–40 mm long (vs. V. phlomoides, with leaves not, or only very shortly, decurrent on the stem, and floral bracts 9–15 mm long). 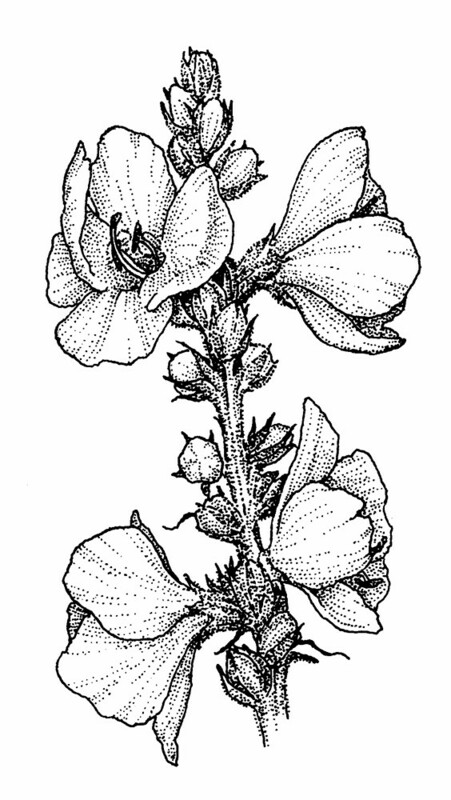 orange mullein. CT, MA, ME, RI, VT. Fields, roadsides, waste areas, wool waste.